Happy Harriet Carter Wednesday boys, girls, and transgender individuals who are built with both boobies and ding dong. Do I have a treat for you today! IBBB is proud to present to you the very first Harriet Carter crapalog that was ever created. Ever! Basically, what we have here is white-trash products of yesteryear. Horses were all the rage in the 50’s and 60’s, as were “joke legs,” and peepholes. Not much has changed since then and I like that. Let’s go! Product # 1 – A car without horses, I don’t think so! Back when Harriet Carter was a little slutty douche running around there must have been a lot of drivers on the road who liked to sleep whilst they drove. Who needs to wake them up with a severe honking horn? No sir. You wake up people on the road with horse sounds, duh! 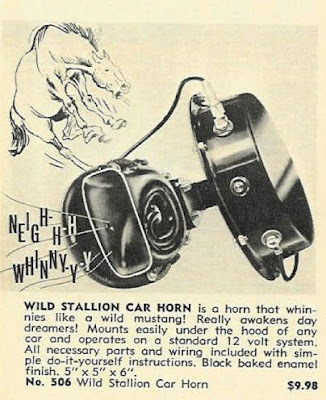 According to the description, this “wild stallion” car horn “whinnies like a wild mustang.” Ok, I’m a city kid. I technically don’t know what 3 of those words mean. Whinnies? Like Winnie Cooper? No idea. Regardless, I think this is a great idea. Just as your about to fall asleep you hear a horse chasing you. Not only would I wake up immediately I would also need to pull over to chisel the skid marks out of my underoos. Actually, either that or I’d just stay asleep dreaming that I’m riding a horse on some white-trash farm. Moving on to the photo of the horse. Now is that horse technically being shot or kicked in its nuts? It’s hard to tell. It’s definitely dying. That I know for sure. I’ve never known a horse to have smokers cough like that, but apparently it exists. It was nice of the artist to remind us that the horn actually says, “Neighhh” and also “Whinny!” I challenge you all to make these noises the next time your in traffic. Simply put your head out the window and just yell, “Hey buddy, Neighhhh! Whinny!” They’ll know. Oh, they’ll know. 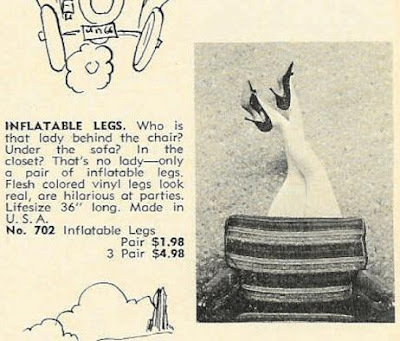 Product # 2 – Clearly the Great Depression must be over because people were spending their money on inflatable legs. I’m going to repeat that. Inflatable legs. Once more. Inflatable legs. In between beating your wife for burning the roast, you can also play marvelous tricks on all of your dirt bag friends. Simply inflate these woman’s legs and place them in very funny places. The description even gives you a bit of a script. It says, “Who is that lady behind the chair? Under the sofa? In the closet? That’s no lady – only a pair of inflatable legs!” Oh it gets better. OF COURSE it was made in the USA. No no no, we’re not going to focus on our automobile production. Japan will never catch up with us on that.! All of our resources are going towards producing life-like inflatable legs so that we can play jokes. If I walked into a house that was playing a joke on me like this I’d pop the legs as soon as I saw them. This is reason # 2 why I also carry a pin with me wherever I go. I’ll explain reason # 1 at another time. The guy that tries to pull this comical joke over on his wife better hope that those inflatable legs open up and have a hole somewhere near the middle because that’s the only action he’ll be getting from anything female-like in a long time. This is such a great deal. You can either buy 1 pair for $1.98 or 3 pair for $4.98 to help realyl master your manage a trois joke. Giggity. Product # 3- Ding Dong! Better put down the casserole you’re making and grab your baby because someone is at the door. But who? Your husband is working at his job, chasing his secretary around his desk, and bringing home the money to pay YOUR bills….so it can’t be him at the door. But who? If only there were some kind of hole in the door that would allow you to see out without someone seeing in. Well, now there is, Lucy Ricardo! Thanks to the brilliant folks at the Harriet Carter factory you can now see that creepy man with a topcoat and rain hat grinding his teeth and standing 1 inch in front of your door. 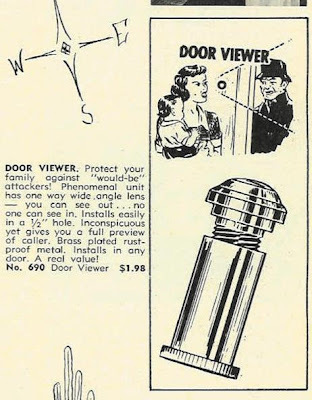 As the description says, “Protect your family against would-be attackers” and now you can! Just think, the safer you are the more pot roasts you can make and the more needlepoint you can do. But don’t waste all your energy on those activities because when your husband gets home he’s going to want your full attention and energy so you can serve him, wait on him hand and foot, and be ready to give it up when little Johnny gets tucked into bed. Ahhh yesteryear. What a simpler time. In closing, here’s the back of the original Harriet Carter catalog. I’ve received many many many many emails from you over the years telling me that the Harriet Carter catalog would just mysteriously appear in your mailbox when you were little even though no one in your family ever ordered anything from it. Well, if was delivered to the wrong house apparently Harriet Carter didn’t even want it back. Check out the message on the back. It says, “If Undeliverable After Forwarding, DO NOT RETURN.” Mystery solved! Harriet Carter White Trash Wednesday!